MadWorld is a video game developed by Platinum Games and published by Sega. It was released exclusively for the Wii on March 10, 2009 in North America, and will be followed by March 20 in Europe and March 26 in Australia. Control is handled through the Wii Remote and Nunchuk attachment, with the Remote controlling the weapon and the Nunchuk moving the character. MadWorld does not make use of the Wii Remote's infrared sensor, as its developers found it unnecessary to pinpoint movements on the screen in order to attack. Players perform brutal melee attacks on enemies using objects found throughout the environment, such as impaling an enemy's head with a caution sign. The game features extreme, over-the-top violence, but designer Shigeunori Nishikawa intended it to be seen in a comical light despite the dark tone of the game. For example, in a minigame called "Man Darts," players must hit enemies onto a giant dartboard with a baseball bat to score points. However, because of the level of violence, Platinum Games is unsure of whether or not the game will ultimately be released in Japan, stating, "In certain markets there are a lot of limitations on the amount of violence you can show, so we definitely have the Western market much more in mind." 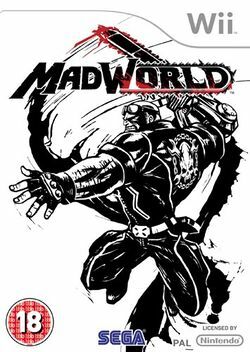 MadWorld features highly stylized graphics that use a limited color palette of high contrast black and white with red blood, partially inspired by Frank Miller's Sin City graphic novels. In MadWorld, Varrigan City has become a target for a group of terrorists known as "The Organizers." The Organizers have taken over the city and transformed it into the setting for a game show called Death Watch, where the city's citizens are being forced to fight for their lives against mysterious enemies, for a prize of 100 million dollars. From a third-person perspective, the player controls Jack, a mechanic and former marine with a chainsaw on his arm, as he competes in the violent television show. This page was last edited on 11 March 2009, at 15:11.